Pears are a favourite fall fruit of mine. They bring to mind the backyard of my childhood home, which had both a pear tree and an apple tree. To this day I prefer a fragrant, juicy pear over an apple any day of the week. My kids love pears too, and I buy them in 6 pound bags. Because of this, it can be a bit tricky to catch them all at the perfect ripeness. But when they are perfectly sweet and at their peak, I can eat two at once. A few days later, they get to be rather soft, which is the right time to salvage the fruit and puree a batch. And then we can make these delicious gingery waffles. 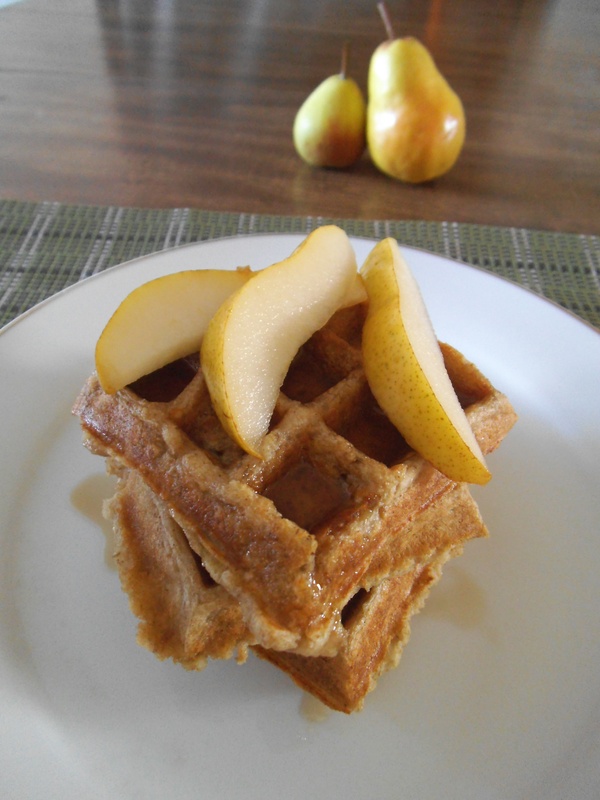 If you have more than one cup of pear puree, it may serve as a topping for the waffles. Or freeze it and stay tuned for more pear recipes this month! You can also take the convenient route and puree canned pears. In either case, the natural sweetness of the pears is just right, and there is no need to add sugar to the batter. A drizzle of maple syrup adds any further flavour you might wish for. Optional soaking step: Combine oats, lemon juice and milk and let soak for several hours or overnight. Combine flours, baking soda, ginger, and salt in a mixing bowl. In a separate bowl, beat together eggs, oil or butter, and pear puree. Add almond milk and oats. Combine wet and dry ingredients, stirring together until evenly incorporated. Heat waffle iron and spray or baste with oil. Cook waffles until golden. Cover to keep warm. Serve waffles with buttery spread and maple syrup, pear sauce, or blueberry-pear filling. We have a pear tree in our yard but I’ve never thought to make waffles with them. I might have to give it a try! Stopping by from Saturday Dishes. Pinning!